← What’s to love about Mali? Four things. The remote village of Tessalit, way up in northern Mali close to Algeria, holds the key to the future of the Saharan region. Anyone in Mali will tell you this. The Guardian‘s Afua Hirsch spoke to a few of them before writing about Tessalit’s “geostrategic importance” this week. According to one of her sources, in fact, Tessalit is among the top three most important locations on the planet. Set aside for a moment that the source in question was a tour guide. Last month I discussed the misuse of the term “strategic” in recent writing about Mali. To recap: a location is strategic irrespective of the events swirling around it. The bridge over the Niger River at Markala is, by definition, strategic: to drive a truck or tank across that river anywhere between Bamako and Gao (a span of over 1000 km), Markala is the only way to go. Places like Diabaly and Konna, on the other hand, happened to be the sites of early confrontations between Islamist and Malian government forces in January, but lack inherent strategic value: the battles could just as easily have taken place somewhere else. Once the Islamists left, these towns were no longer important to the security of government-held territory. In Mali it’s said that Tessalit has long been coveted by Mali’s neighbors and by the great world powers. During the Tuareg rebellion early last year, the press in Bamako was rife with speculation that Sarkozy incited the rebellion because President Amadou Touré had refused to grant France a permanent base there. Tessalit’s vital importance is one of those things people in Mali simply know to be true. Another thing they simply know to be true is that their country’s population has twice as many women as men. (Opinions vary: some say three times as many.) Another is that Mali’s King Aboubakar II led a fleet of canoes from West Africa to the New World, more than a century before Columbus. Yet another is that the U.S. has 52 states. It doesn’t matter that there’s no evidence for any of these things; people like Hirsch’s tour guide nonetheless accept them as fact. Maybe Tessalit has “geostrategic” value, maybe it doesn’t. The problem is that, as with so much pertaining to Mali these days, it’s impossible to say for sure. There’s simply no way to verify many of the claims being made about events in the country, no way to know which are accurate, which are exaggerations, which are erroneous, and which are downright deceitful. Has the emirate of Qatar been supporting Islamist rebels? This is another charge taken as gospel truth in the Bamako press; similar allegations have appeared on Algerian websites. Did Malian soldiers in the recently liberated city of Gao indeed find “drug money” and proof of Gulf Arab states’ financial assistance for the rebels? Consider this video from a recent news broadcast on state television. “This is proof that the combatants were paid,” a soldier announces, holding up a sheet printed in French. Yet it’s hard to know from the footage exactly what was found. 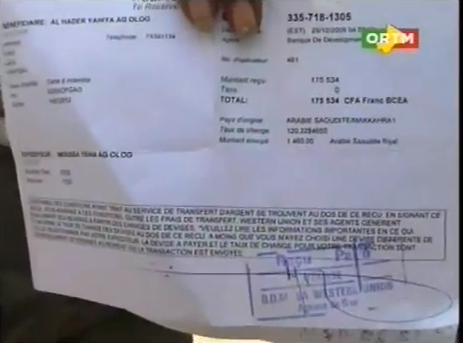 A close inspection of a still image (below) shows the sheet to be a Western Union money transfer receipt from a BDM ban k branch, received before the Islamist takeover (the banks in northern Mali all closed after the Malian army was expelled in early 2012). We are also shown images of handwritten Arabic documents, which the newscaster tells us record the Islamists’ payroll and financial transactions. But is this “proof” convincing? Have Malian troops committed human rights abuses against civilians, as foreign watchdog groups maintain? Absolutely not, according to one Malian rights organization, which accuses Human Rights Watch and Amnesty International of mounting a disinformation campaign to discredit the Malian government. Did the Malian armed forces in fact spearhead the counter-offensive against Islamist rebels last month, making French military intervention unnecessary? This is what Dr. Rokia Sanogo, a leader of the MP22 political movement, has recently claimed. She and her boss Oumar Mariko have been railing against foreign intervention ever since the coup last March, and the popularity of Operation Serval notwithstanding, they’re sticking to their line that the Malian army never needed anyone’s help to restore the country’s territorial integrity. Forget about that negative coverage in the Western media describing Mali’s army as a shambles, clearly part of an imperialist plot to undermine the country’s sovereignty. (Forget, for that matter, about a candid video showing coup leader Captain Amadou Sanogo lambasting his troops on 12 January for their indiscipline and cowardice during the Islamist assault on Konna.) These days you can believe whatever you want and find reporting to back you up. French-speakers like to draw a rhetorical contrast between “info” and “intox,” i.e. truthful claims and disinformation. What I’m noticing more and more is the impossibility of distinguishing between these two categories. Mali’s vibrantly free press and the rising (though still small) numbers of internet users have not fostered an informed populace. If anything, new media technology has only muddied the waters, turning the country into a fact-free zone. For Mali-watchers in the “reality-based community,” sorting truth from fiction has become an ever-more frustrating task. Maybe the U.S. and France actually do want to set up secret military bases in Tessalit. Maybe President Touré actually did take kickbacks from drug smugglers and kidnappers. Maybe foreign mercenaries actually did take part in the failed “counter-coup” on 30 April last year. My concern is that, amid the flood of innuendo, speculation and distortion, we’re not seeing hard evidence for these claims. People like to say that time will tell, but in Mali time has a way of keeping its secrets buried. Postscript, 20 June: Rumors of US and French interest in setting up a military base in Tessalit have resurfaced on the website Saharamedias.net. This entry was posted in Uncategorized and tagged Amadou Toumani Toure, France, Islamism, rebellion, Tuareg. Bookmark the permalink. Hi Bruce, nice to read another of your texts, keep up the good work. Another exemple of a theme where it is difficult to get to the facts is the real or supposed food crisis in Mali or in northern Mali. 2012 crops have on a whole been abundant, which is left out of consideration by many journalists and humanitarians. Sorting truth from fiction is always a difficult task, and perhaps more than ever in the prevailing situation in Mali. Nevertheless, I would like you to dig a little bit deeper on the causes why information is concealed or distorted, as this may help sorting truth from fiction; maybe you can develop this in a future text? Information may be distorted, intentionally or not, for ideological reasons. Scientists indulge in this, fitting facts to established theories and leaving deviant facts out of consideration. Dr. Rokia Sanogo’s claims offer an obvious example of this, but things are not always that obvious. Information may be misunderstood or misinterpreted for lack of time, laziness or ignorance, an obvious problem for reporters who didn’t know Mali from Malawi before being sent here and for journalists who are running for get to the (military) front that hardly ever existed anyway in this conflict. They have to rely on whatever they have at hand, be it hearsay, “common knowledge” or rumors, to dress up their articles and presentations. Of course, what is presented as a fact may be just deduction or pure invention. The risk of this grows when the access to certain places or information is officially blocked, even if this blockage is said to be for the security of the journalists themselves. I look forward to you developing this theme further in a future post! Thanks for this assessment – which is very much in need, given the pepperings of reports now coming out, many of which lack sources. Also, I agree with Klass, on assessments of food security. Humanitarian org’s. may announce low crops, without factual backup (I know, working with many across Africa…). Well, at least the situation of the mss. of Timbuctoo seems to be more accurately reported in some sources. Of course local families with mss. collections would seek to hide them in the face of a serious threat, as they’ve done for generations. And I imagine John Hunwick must still be writhing from the manner in which the press has been treating the issue of mss. An airstrip makes a location strategic. But is that enough also to make the place the key to the entire region’s security? An airstrip hundreds of miles from any population center would hardly be considered strategic under most circumstances. US and French military and intelligence forces don’t require a long runway (such as what appears to be at Tessalit) to launch and recover drone sorties, nor for transports like Transalls and C-17s. 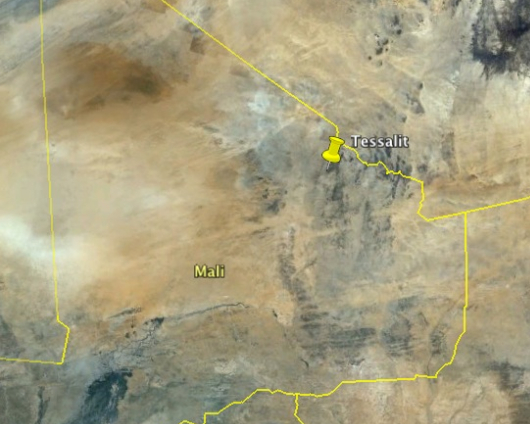 Unless they’re planning to deploy fighter aircraft to northern Mali, the airstrip at Tessalit wouldn’t provide any capability that couldn’t more easily be obtained elsewhere. Moreover, the airfield at Tessalit appears to lack any kind of logistics or support infrastructure (hangars, fuel storage, or any buildings at all) which would have to be built to sustain significant air operations. It would be comparatively easier to use established air bases in Bamako, or even Chad or Senegal. Thus we return to Bruce’s original question: can something be considered to be “strategic” if it has no intrinsic value apart from a (probably temporary) proximity to current events? Thanks for this analysis – as an Air Force mission planning officer, you definitely have more authority to speak on such matters than do I.
Glad I (belatedly) discovered your blog. Nice work, Bruce. I too find myself threading my way between reasonably provable ‘facts’ and what you call ‘intox.’ Mali is rife with informal disinformation. And then there’s Algeria. There you get official disinformation. I hope you and I can compare notes from time to time as this thing unfolds. I like your distinction between “informal” and “formal” disinformation–we tend to see the informal kind in Mali, since the style of the ORTM and the defense ministry’s information bureau (DIRPA) is more to keep silent about something (even, or especially, when everyone else is talking about it) than to make deliberately false claims about it. But there’s some of the latter too. I found the competing claims between the two different Human Rights groups to be especially interesting. It reminded me that after the battle for Konna, the director of the Malian group said he had heard via cell that the Islamists were conducting “beheadings” in the town beforehand. Sounded a little extreme, even for the Islamists. Therefore, I continue to treat this with as much skepticism as I do the claim by an Ansar Dine leader that French airstrikes had killed “dozens” of civilians in the town. Great example – that claim has appeared in a recent article in “22 Septembre“, which is usually one of Bamako’s more reputable papers. The journalist claims that 37 Malian soldiers had their throats cut by the Islamists, and quotes a Konna resident who says he took part in the mass burial. Of course DIRPA has said nothing about this, so it’s difficult to know what to think. Another rumor now making the rounds on the internet (surely soon to be reprinted in the Bamako press): Westerners posing as journalists are bribing residents of Gao to make false statements accusing Malian troops of abusing civilians. There are already calls for mass mobilization against this alleged practice. It sounds pretty exhausting trying to separate fact from fiction on the ground in Mali these days, but your efforts are deeply appreciated here in the States, Bruce.